As hundreds of Palestinians marched in occupied East Jerusalem, on Saturday evening, in solidarity with the hunger striking Palestinian detainees in Israeli prisons, Israeli soldiers assaulted the nonviolent protesters, deliberately targeted local journalists, damages their cameras, and abducted three protesters. 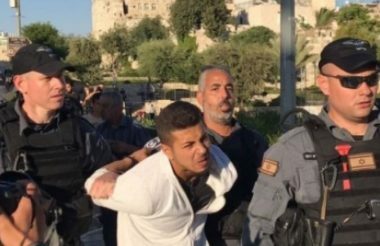 The soldiers, and police officers, assaulted a group of Palestinian journalists and photojournalists, near Nablus Street, in Jerusalem, as they were documenting a nonviolent procession in support of the Palestinian detainees, holding an open-ended hunger strike in Israeli prisons, for the thirteenth consecutive day. The soldiers deliberately damaged cameras and equipment, owned by journalist Ahmad Gharabla, who was also assaulted by the soldiers. The soldiers also assaulted photojournalists Mahmoud Oleyyan, Sinan Abu Meizar, Mustafa al-Kharouf, Fayez Abu Rmeila, Rami Khatib and Rajaey Khatib and a journalist identified as Dyala Jweihan.